(306) Then he (Thunder Cloud) told us about his dream. “At the very beginning there up above, medicine men came into existence in what served as a village. The various spirits up above in the clouds, all taught something, instructing me on what I was to do. Right at the onset they were teaching me. They said, ‘Human, let's give it a try.’ A great rotten log covered in moss lay in the middle of the lodge. There the medicine men had me give it medical treatment. When he first breathed, all those all those who were in the lodge, everyone of them, breathed with him; the second time, when again he breathed, they all breathed with him. For a third time, they again breathed on him, and for a fourth time, they breathed on him. (307) The dead log arose and walked away as a young man. After the fourth breathing, a man got up and walked away. ‘Human, it is very holy,’ they said to me. And again they came for me from the Ocean Sea. Where in the middle of the Ocean Sea there is a village of medicine men, there they blessed me. As many as had been placed in the Ocean Sea, all these blessed me. There they made me test my powers. All the waves, as many as there are throughout the whole Ocean Sea, they asked me to blow upon. After I made my exhalations, it became calm. It became like what fills a small saucer. Again for a third time I blew upon it, and again it was that way. The fourth time they made it choppy and piled up, and again they told me to blow upon it. They said that it would show my power. I blew, and the Ocean Sea, as mighty as it was, was stilled. “‘Human, this is the way that you will have to do it,’ they said. ‘There is nothing that you cannot accomplish. No matter what the illness, you can cure all of them,’ they said. And again, all those of the earth, as many as there are, blessed me. ‘If a human moves away from the light and pours tobacco for you, we will do for you whatever you demand,’ they said. Here at what they call "Blue Clay Banks," what is called "a dancing grizzly bear," was there and blessed me. If at some time I should meet with any kind of trouble, they would help me, they said. If I pour as much tobacco as I think, they will smoke it, they said. They gave me breaths (songs), and they gave the power to see them, a holy thing, they said. (308) And they gave me their claws, which are very holy things, they said. Then the grizzly bears danced, performing while dancing, and they would rip open their own abdomens, and coming away snorting, and making themselves holy (xop), they would heal themselves. Then they did it again. They shot grizzly bear claws at each other until they were choking badly on their own blood, but making themselves holy (xop), they became cured. And again, some of them did this: they made their paws disappear into the mud, then they would pull out a lotus root (čérap) there. And again they would grab a plum tree there, and they breathed upon it, and as they shook it, many plums fell from it. And again, he knew all of the good medicine, and all of it was in its natural form, and he said it will make me well, as indeed it did. I recovered from my illness. I believed that since he was holy, I had been cured of my illness. Then again once while Thunder Cloud was sleeping, he dreamt. He met a man and he was a white looking man. (309) "Dressed in white buckskin, he was pleasant to look upon," he said. "My friend, it is not through mere chance that I have come to you," he said to him. A good deed you have done, and for this reason I am going to bless you," he said to him. "He is the one whom they call 'Nephew'," he thought. "Whatever you will say, if only you say it, as many of those who have not listened, all these will be confounded; and as many as listened, these at least will live. Just as they say how the one whom we call 'Nephew' denied reincarnation to the bad spirits, as many as there are, you will bring back as many as there are to these sorts who doubted your teachings," he said to him. And again they say one can be reincarnated if he fasts, and if he fasts a great deal, then certainly one of the various spirits will bless him. When the man (Thunder Cloud) finally died, the various ones who had blessed the ghost, those various spirits told him that he could go back there. He did well if he became human again. He could come back as a human being and live, they used to say. Commentary. "breathed" — life and breath, or more broadly conceptualized as wind, are so closely related that in Hočąk the word for breath, ni, also means "life." "Ocean Sea" — the Hočąk Te Ją means, "the Encircling Lake." This is the same as the ancient Western idea of the Ocean Sea (Ὠκεᾰνός) that formed the rim of the world circling the dry land masses of the earth. "the waves" — "breath," "life," and "water," are homonymously denoted by the same word ni. Life is particularly connected to water through blood. Illness can be conceived as a disturbance of the life, blood, and breath. Analogously, the Ocean Sea becomes choppy on account of the wind. On the principle that like has power over like, the application of ni-as-breath to ni-as-water can be thought analogous to the application of sacred breath to a sick person's disturbance of life/blood/breath. His power to make placid the ni applies to both somatic and extra-somatic ni. If a man can still great disturbances in the most fundamental form of ni, then he should be able to do the same for somatic ni. "a small saucer" — the image of the saucer is apropos here. Hot soup placed in a saucer is likely to be cooled by blowing on it. People with diseases frequently run a temperature, so here again we have the power of ni as breath over the ni of the water/blood. "moves away from the light" — the Hočąk is hąp-haixa(na)wa. Hąp, especially in the Medicine Rite, is a metaphor for life, and is usually translated as "Light-and-Life." So a person who has come down ill is moving away from the "light," most especially in this metaphorical sense. Even literally, inasmuch as the sick are likely confined to their lodges, they are moved away from the light. "Blue Clay Banks" — Maničóros is St. Paul, Minnesota, so called from the blue clay that could be obtained there. This is from Mąnį-čo-horos: mąnį, "earth-water" ("mud"); čo, "blue"; ho-, "the place at which"; ros (for rus), "to take." The blue clay was used for making paint of that color used in ceremonies. (Jipson, Susman) Helmbrecht-Lehmann record the variant Mąčó Horús. The subsequent appearance of grizzly bears plays upon this name, since the word for grizzly bear is mąčo. 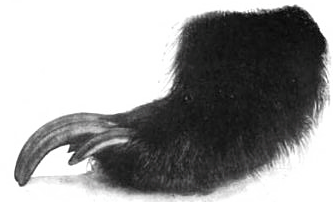 "claws" — the word here is ara, literally "their arms," by which may have been meant their whole paws rather than the standard claws. Xop is a kind of supernatural power that takes over a person. This kind of frenzy is also expressed in the word xo, of which xop is apparently an expansion. The word xo means "wrong, crazy." Both xo and xop describe a state of possession. This kind of frenzied possession might be expected to be particularly characteristic of dancing Grizzly Spirits. We also see this kind of possession at warbundle feasts where a holy person is called upon to recount his war exploits. The Grizzly Bear dance was known to Little Priest, the last war chief of the Hočągara. He was able to cure his wounds through the xop of the frenzied dance imparted to him through the agency of the spirits (q.v.). Unfortunately, he does not make clear just what these mystical powers are. "a plum tree" — this may play upon the pun of kąč, k’ąč, "plum," and k’ač, kač, "to help, benefit." In Bear Clan ideology, the bear occupies all three cosmic regions: the upper world (tree climbing), this world, and the lower world (denning). We see this in their ability to extract valuables from under the soil, and their ability to extract them from the upper world of trees. "depositories for holy objects" — the Hočąk is mą́woja, from mą, "earth, ground"; and woja, "to be fruitful." Radin says, "It refers to places where blessings, such as food, etc., are stored for the faster." The translation for this word is that used by Marino. "a white looking man" — the Hočąk is wąk skaižoné, which Radin translates as "looking very much like a white man." However, the term for a white man in the racial sense, is waxopinisga, "white spirit being." The man of the vision is compatible with being a white man in this sense, but he may also be a man whose appearance exemplifies the holiness symbolized by the color white. "Nephew" — this is a reference to Hare, who refers to humanity as "my uncles and aunts." Inasmuch as he was the product of a virgin birth from a human female, all humans necessarily have this relationship to him. It is clear that Thunder Cloud believes that it is Hare who has come to him. "you will bring back" — a reference to the practitioners of the new religion, the Peyote cult of Christianity (the Native American Church). Thunder Cloud was a prominent member of the Medicine Rite which was a competing religious system to the "Mescal Eaters." Hare (if that is who this spirit really is), is blessing Thunder Cloud with the power to win converts back to the old religion from among the Christians. "they ate human beings" — Radin remarks that, "Every now and then the narrator [Sam Blowsnake] cannot refrain from making fun of the older beliefs, and this is especially the case when he speaks of mythological figures such as the cannibals [Giants]." Stories: mentioning Thunder Cloud: Thunder Cloud Marries Again; featuring Hare as a character: The Hare Cycle, Medicine Rite Foundation Myth, The Necessity for Death, The Mission of the Five Sons of Earthmaker, Hare Acquires His Arrows, Hare Retrieves a Stolen Scalp, Hare Recruits Game Animals for Humans, Hare Kills Wildcat, The Messengers of Hare, Hare Secures the Creation Lodge, Hare Kills Flint, Hare Kills Sharp Elbow, Hare Visits His Grandfather Bear, Grandmother Packs the Bear Meat, Hare Visits the Bodiless Heads, Hare Visits the Blind Men, Hare Kills a Man with a Cane, Hare Burns His Buttocks, Hare Gets Swallowed, The Hill that Devoured Men and Animals, Hare Establishes Bear Hunting, Grandmother's Gifts, Hare and the Grasshoppers, The Spirit of Gambling, The Red Man, Maize Origin Myth, Hare Steals the Fish, The Animal who would Eat Men, The Gift of Shooting, Hare and the Dangerous Frog, The Coughing Up of the Black Hawks, The Animal Spirit Aids of the Medicine Rite, The Petition to Earthmaker; mentioning ghosts: The Journey to Spiritland, The Four Slumbers Origin Myth, The Resurrection of the Chief's Daughter, Holy One and His Brother, Worúxega, Little Human Head, Little Fox and the Ghost, Pete Dupeé and the Ghosts, The Lame Friend, Ghost Dance Origin Myth I, Ghost Dance Origin Myth II, Hare Steals the Fish, The Difficult Blessing, A Man's Revenge, Two Roads to Spiritland, Sunset Point; about the journeys of ghosts to and from Spiritland: The Journey to Spiritland, The Four Slumbers Origin Myth, Ghost Dance Origin Myth II, The Resurrection of the Chief's Daughter, The Lame Friend, Ghost Dance Origin Myth I, Holy One and His Brother, Thunder Cloud is Blessed, Two Roads to Spiritland, Sunset Point; featuring Giants as characters: A Giant Visits His Daughter, Turtle and the Giant, The Stone Heart, Young Man Gambles Often, Spear Shaft and Lacrosse, Redhorn Contests the Giants, The Sons of Redhorn Find Their Father, Morning Star and His Friend, The Reincarnated Grizzly Bear, The Old Man and the Giants, Shakes the Earth, White Wolf, Redhorn's Father, The Hočągara Contest the Giants, The Roaster, Grandfather's Two Families, Redhorn's Sons, The Meteor Spirit and the Origin of Wampum, Little Human Head, Heną́ga and Star Girl, Rich Man, Boy, and Horse, Sun and the Big Eater, The Big Eater, How the Thunders Met the Nights, The Origins of the Milky Way, Ocean Duck, The Blessing of a Bear Clansman, Wears White Feather on His Head, cf. The Shaggy Man; mentioning the Ocean Sea (Te Ją): Trickster's Adventures in the Ocean, Hare Retrieves a Stolen Scalp (v. 1), Otter Comes to the Medicine Rite, The Rounded Wood Origin Myth, The Baldheaded Warclub Origin Myth, Trickster and the Children, The Twins Retrieve Red Star's Head, Wears White Feather on His Head, White Wolf, How the Thunders Met the Nights (Mąznį’ąbᵋra), Bear Clan Origin Myth (vv. 2a, 3), Wolf Clan Origin Myth (v. 2), Redhorn's Sons, Grandfather's Two Families, Sun and the Big Eater, The Journey to Spiritland (v. 4), The Sons of Redhorn Find Their Father (sea), The Dipper (sea), The Thunderbird (a very wide river), Wojijé, The Twins Get into Hot Water (v. 1), Redhorn's Father, Trickster Concludes His Mission, Berdache Origin Myth, Morning Star and His Friend, How the Hills and Valleys were Formed. Themes: something is of a (symbolic) pure white color: White Bear, Deer Spirits, The Journey to Spiritland (v. 4), White Flower, Big Eagle Cave Mystery, The Fleetfooted Man, Thunderbird and White Horse, The Orphan who was Blessed with a Horse, Worúxega, The Two Boys, The Lost Blanket (white spirits), Skunk Origin Myth, He Who Eats the Stinking Part of the Deer Ankle, White Wolf, A Man and His Three Dogs, The Messengers of Hare, The Brown Squirrel, The Man Who Fell from the Sky, Bladder and His Brothers, White Thunder's Warpath, The Shell Anklets Origin Myth, The Dipper, Great Walker's Medicine (v. 2), Creation of the World (v. 12), Hare Secures the Creation Lodge, The Descent of the Drum, Tobacco Origin Myth (v. 5), The Diving Contest, Otter Comes to the Medicine Rite, The Arrows of the Medicine Rite Men, The Animal Spirit Aids of the Medicine Rite, Grandmother's Gifts, Four Steps of the Cougar, The Completion Song Origin, North Shakes His Gourd, Lifting Up the Bear Heads, Peace of Mind Regained; a spirit is quoted as he gives someone a blessing: Earthmaker Blesses Wagíšega (Wešgíšega), Traveler and the Thunderbird War, The Nightspirits Bless Jobenągiwįxka, Disease Giver Blesses Jobenągiwįxka, Eats the Stinking Part of the Deer Ankle, The Man Whose Wife was Captured, The Blessings of the Buffalo Spirits, The Stench-Earth Medicine Origin Myth, The Boy who was Blessed by a Mountain Lion, Ghost Dance Origin Myth I, The Woman Who Fought the Bear, The Blessing of a Bear Clansman, Aračgéga's Blessings, The Girl who Refused a Blessing from the Wood Spirits, The Meteor Spirit and the Origin of Wampum, Great Walker's Medicine, Buffalo Dance Origin Myth, Thunderbird and White Horse, The Plant Blessing of Earth, The Completion Song Origin, The Man who was Blessed by the Sun, The Difficult Blessing, The Blessing of Šokeboka, A Waterspirit Blesses Mąnį́xete’ų́ga, Bow Meets Disease Giver, Heną́ga and Star Girl, Sunset Point, The Rounded Wood Origin Myth, A Peyote Vision, The Healing Blessing; anthropophagy and cannibalism: A Giant Visits His Daughter, Turtle and the Giant, The Witch Men's Desert, The Were-Grizzly, Grandfather's Two Families, The Roaster, Redhorn's Father, Hawk Clan Origin Myth, The Lost Blanket, Young Man Gambles Often, White Wolf, The Shaggy Man, The Twins Get into Hot Water, Partridge's Older Brother, The First Fox and Sauk War, The Fox-Hočąk War, The Hočągara Contest the Giants, Morning Star and His Friend, Baldheaded Warclub Origin Myth, The Seven Maidens, Šųgepaga, The Reincarnated Grizzly Bear, The Woman who Loved Her Half-Brother, The Blessing of a Bear Clansman, Shakes the Earth, The Stone Heart. 1 Paul Radin, "Personal Reminiscences of a Winnebago Indian," Journal of American Folk-Lore, 26, #102 (1913): 293-318 [308-310]. 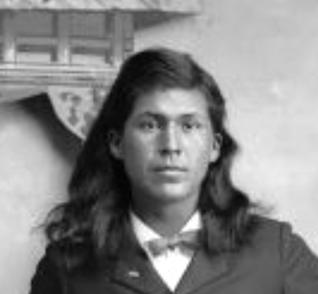 Informant: Sam Blowsnake, Thunderbird Clan. 2 Paul Radin, The Winnebago Tribe (Lincoln: University of Nebraska Press, 1990 ) 234. 3 Radin, Winnebago Tribe, 470-471. 4 Melvin Randolph Gilmore, Uses of Plants by the Indians of the Missouri River Region, Thirty-Third Annual Report of the Bureau of American Ethnology, 1911-12 (Washington, D. C.: Government Printing Office, 1919) 39.